If you were to walk by and look into the Chase Family Arena this summer, there’s a pretty good chance you would have seen forward Cherelle Moore '15 taking extra shots. 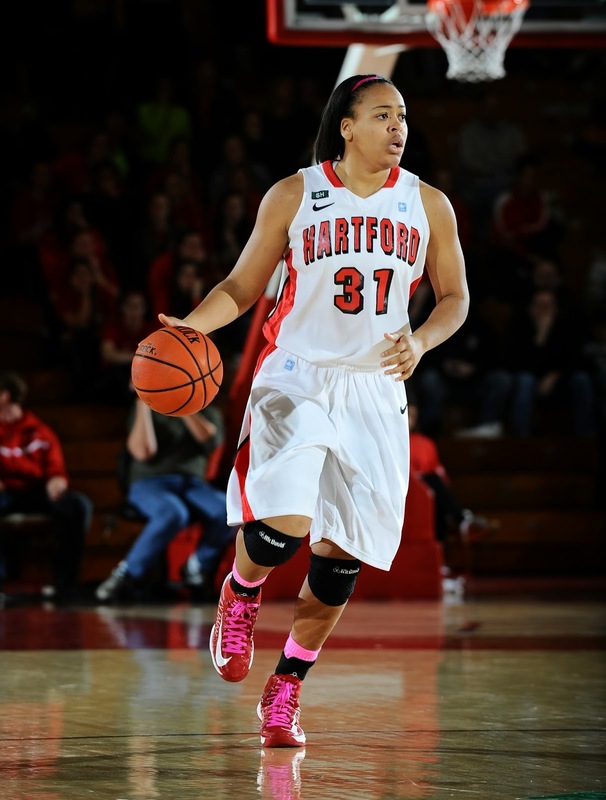 Moore, a Bridgeport, Conn. native, dedicated the off-season to getting in the best basketball shape of her life while completing her summer classes at the University of Hartford. "Getting in shape was the main goal for me over the summer," said Moore. "My basketball IQ is there, but I realized that I needed to get in shape to become a better player. I worked really hard on improving my basketball skills." "This was a big off-season for Cherelle and she took full advantage of her opportunity to work hard and get in great shape," said Coach Rizzotti. "She was always a good athlete but she took a step forward when she shed her self-imposed physical limitations." Moore, a six-foot junior forward with the ability to play the wing or post position, emerged as consistent rebounder for the Hawks down the stretch of last season. She became a key player in the lineup and helped lead the Hawks to the America East championship game. Her teammates and coaches voted Moore the most improved player after the season. "The confidence Cherelle has in herself right now has correlated to her being more of a vocal leader," Rizzotti added. "She knows she’s an upperclassman now and this is her time to lead by example as well. After two years, she has learned what it means to be fully committed and she is a terrific example to the young players of what working hard and making mental adjustments can do for individual growth." Moore is excited about the potential her team has this season and is determined to win the conference championship. “With our depth and fast-paced style, we want to be able to run teams out of the gym this year,” explained Moore. "We know what it takes to get to the championship game—it hurt losing in it last year, but it fueled us, and we are coming back angry and determined to be the last team standing." Hartford opens the season on November 9 against the defending national champion UConn Huskies.